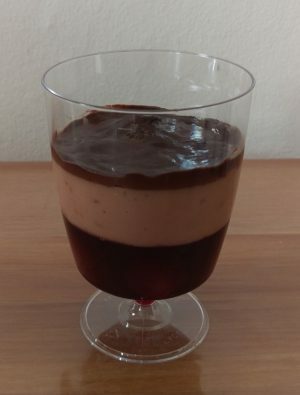 This is a three-layered dessert I invented a while ago. Its main ingredients are Baileys (Irish cream liqueur, hence the “Irish” part of the name), cherries, milk and chocolate. This recipe is for 12× 200 ml glasses. I made all of this in a microwave but conventional heating methods will obviously work equally well. Sieve the cherries and keep the juices for later. Distribute the cherries evenly among the 12 glasses. Mix the Vege-Gel and sugar with a bit of cherry juice and mix well. Add the rest of the juice and heat the mixture until it is gelling. Pour everything evenly among the 12 glasses. Let it cool. Mix the Baileys with the milk. Mix the cornflower, cocoa powder and Vege-Gel with a bit of the liquid and mix well. Add the rest of the liquid and heat the mixture until it is gelling. Pour everything evenly among the 12 glasses. Let it cool. Heat the dark chocolate with the cream until it is melted. Pour evenly over the 12 desserts. Let it cool. Enjoy! This entry was posted on Monday, 5th September 2016 at 17:17.